Five facts to pull out at your next real-versus-plastic-tree debate. There is nothing like the aroma of a Balsam fir filling your living room over the Holidays. Smell is a powerful memory trigger and with Christmas being about traditions, the lasting fragrance of an evergreen is a key ingredient to great ambiance. But if you’ve given all that up for environmental reasons, you may be missing the bigger picture. Life cycle studies examining the impact of real and artificial Christmas trees have found that it’s more a matter of preference than principle. One of the better-known studies comes from the Montreal environmental firm, Ellipsos. Their independent report used a life cycle assessment method to guide consumers on selecting the best tree based solely on environmental arguments. What did they find? Overall, the impact of real Christmas trees is small, and significantly less than artificial trees. And if you want to offset the carbon emissions of either purchase, make it your New Year’s resolution to carpool or bike to work one to three weeks in 2016. Low manufacturing impacts. The study found that natural trees contribute significantly less carbon dioxide (CO2) emissions than artificial trees. Most of an artificial tree’s impacts happen in manufacturing, which means the longer you keep it, the lower its impact on climate change. In order for the artificial tree’s impacts to be lower than a real tree’s, consumers would have to hold on to the artificial trees for 20 years – quite a bit longer than the average six year lifespan estimated in the study. You can reduce your natural tree’s impact. The main source of impact on climate change for a real tree comes from client transport. In other words, driving your car to pick up your tree instead of walking to a neighbourhood tree lot can make a difference. But unlike the impact of artificial trees, this is one you can influence. Natural trees store carbon. Lots of it. Natural tree production has positive impacts on climate change because these trees sequester carbon during the 10 to 15 years it usually takes to grow them. And tree farms often occupy land where no other use can be made – such as areas under electrical lines. There are 20,000 tree growers in North America and it is estimated 73 million new Christmas trees are planted every year. Natural trees produce oxygen. Just like the carbon storing argument, growing natural Christmas trees have other environmental benefits such as providing animal habitats and producing oxygen. 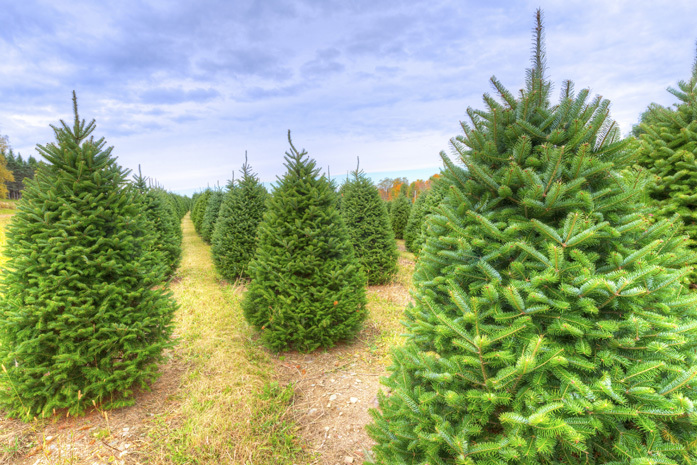 According to U.S. Christmas tree growers, there are over 400,000 hectares in production for growing Christmas trees, and each acre provides enough daily oxygen for 18 people. At last count, Canada had over 30,000 hectares of Christmas trees. Natural trees are recyclable and biodegradable. Most municipalities collect and compost or mulch trees, returning the tree’s constituent parts to the environment. By contrast, artificial trees are made of petroleum-based plastics that are not recyclable. Typically, artificial trees are discarded after six to ten years and will end up in a landfill. Still wondering about which is better? While natural trees offer a number of environmental benefits, the study concludes that if you’re just looking at impact, either choice is relatively small. To offer some context, the life cycle assessment says that the emitted CO2 for the natural tree is about the same as driving a car 125 km. For artificial trees, it would be the same as driving 322 km. So while the effects of each can be small, the real impact here is on our understanding of sustainability, life cycles and the broader implication of the small choices we make on a daily basis. And if that means correcting misinformation and having a spirited debate about where your next Christmas tree comes from, then we here at Resolute are all for it. Why is public transport cost more than personal car?